We are seeing great progress in pancreatic cancer research and the APGI and our collaborators are at the heart of this. The Path to reducing duplication of Human Research Ethics review in Australia. Amber L. Johns, Dianne Nicol, Nik Zeps and Don Chalmers. Medicine and Law. Number 1 March 2017 Vol 36. Lost in translation: returning germline genetic results in genome-scale cancer research. Johns AL, McKay SH, Humphris JL, Pinese M, Chantrill LA, Mead RS, Tucker K, Andrews L, Goodwin A, Leonard C, High HA, Nones K, Patch AM, Merrett ND, Pavlakis N, Kassahn KS, Samra JS, Miller DK, Chang DK, Pajic M, Australian Pancreatic Cancer Genome Initiative, Pearson JV, Grimmond SM, Waddell N, Zeps N, Gill AJ, Biankin AV. Genome Med. 2017 Apr 28; 8(41). doi: 1186/s13073-017-0430-4. SerpinB2 regulates stromal remodelling and local invasion in pancreatic cancer. Harris NL, Vennin C, Conway JR, Vine KL, Pinese M, Cowley MJ, Shearer RF, Lucas MC, Herrmann D, Allam AH, Pajic M, Morton JP; Australian Pancreatic Cancer Genome Initiative, Biankin AV, Ranson M, Timpson P, Saunders DN. Oncogene. 2017 Mar 27. doi: 10.1038/onc.2017.63. Transient tissue priming via ROCK inhibition uncouples pancreatic cancer progression, sensitivity to chemotherapy, and metastasis. Vennin C, Chin VT, Warren SC, Lucas MC, Herrmann D, Magenau A, Melenec P, Walters SN, Del Monte-Nieto G, Conway JR, Nobis M, Allam AH, McCloy RA, Currey N, Pinese M, Boulghourjian A, Zaratzian A, Adam AA, Heu C, Nagrial AM, Chou A, Steinmann A, Drury A, Froio D, Giry-Laterriere M, Harris NL, Phan T, Jain R, Weninger W, McGhee EJ, Whan R, Johns AL, Samra JS, Chantrill L, Gill AJ, Kohonen-Corish M, Harvey RP, Biankin AV; Australian Pancreatic Cancer Genome Initiative (APGI), Evans TR, Anderson KI, Grey ST, Ormandy CJ, Gallego-Ortega D, Wang Y, Samuel MS, Sansom OJ, Burgess A, Cox TR, Morton JP, Pajic M, Timpson P. Sci Transl Med. 2017 Apr 5;9(384). pii: eaai8504. doi: 10.1126/scitranslmed.aai8504. 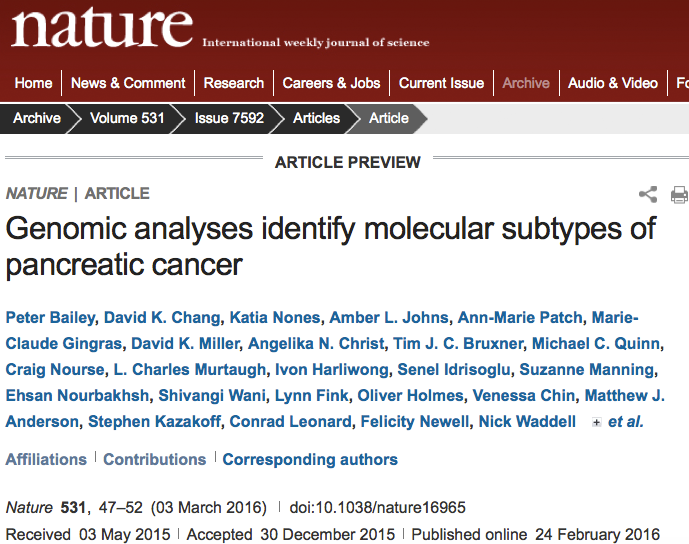 Whole-genome landscape of pancreatic neuroendocrine tumours. Scarpa A, Chang DK, Nones K, Corbo V, Patch AM, Bailey P, Lawlor RT, Johns AL, Miller DK, Mafficini A, Rusev B, Scardoni M, Antonello D, Barbi S, Sikora KO, Cingarlini S, Vicentini C, McKay S, Quinn MC, Bruxner TJ, Christ AN, Harliwong I, Idrisoglu S, McLean S, Nourse C, Nourbakhsh E, Wilson PJ, Anderson MJ, Fink JL, Newell F, Waddell N, Holmes O, Kazakoff SH, Leonard C, Wood S, Xu Q, Nagaraj SH, Amato E, Dalai I, Bersani S, Cataldo I, Dei Tos AP, Capelli P, Davì MV, Landoni L, Malpaga A, Miotto M, Whitehall VL, Leggett BA, Harris JL, Harris J, Jones MD, Humphris J, Chantrill LA, Chin V, Nagrial AM, Pajic M, Scarlett CJ, Pinho A, Rooman I, Toon C, Wu J, Pinese M, Cowley M, Barbour A, Mawson A, Humphrey ES, Colvin EK, Chou A, Lovell JA, Jamieson NB, Duthie F, Gingras MC, Fisher WE, Dagg RA, Lau LM, Lee M, Pickett HA, Reddel RR, Samra JS, Kench JG, Merrett ND, Epari K, Nguyen NQ, Zeps N, Falconi M, Simbolo M, Butturini G, Van Buren G, Partelli S, Fassan M; Australian Pancreatic Cancer Genome Initiative, Khanna KK, Gill AJ, Wheeler DA, Gibbs RA, Musgrove EA, Bassi C, Tortora G, Pederzoli P, Pearson JV, Waddell N, Biankin AV, Grimmond S. 2017 Mar 02; 543(?):65–71. doi:10.1038/nature21063. Precision medicine for advanced pancreas cancer: The Individualized Molecular Pancreatic Cancer Therapy (IMPaCT) Trial. The Individualized Molecular Pancreatic Cancer Therapy (IMPaCT) Trial. Chantrill LA, Nagrial AM, Watson C, Johns AL, Martyn-Smith M, Simpson S, Mead S, Jones MD, Samra JS, Gill AJ, Watson N, Chin VT, Humphris JL, Chou A, Brown B, Morey A, Pajic M, Grimmond SM, Chang DK, Thomas D, Sebastian L, Sjoquist K, Yip S, Pavlakis N, Asghari R, Harvey S, Grimison P, Simes J, Biankin AV, Australian Pancreatic Cancer Genome Initiative (APGI) and the Individualized Molecular Pancreatic Cancer Therapy (IMPaCT) Trial Management Committee of the Australasian Gastrointestinal Trials Group (AGITG). Clin Cancer Res. 2015 Apr 20. [Epub ahead of print]. 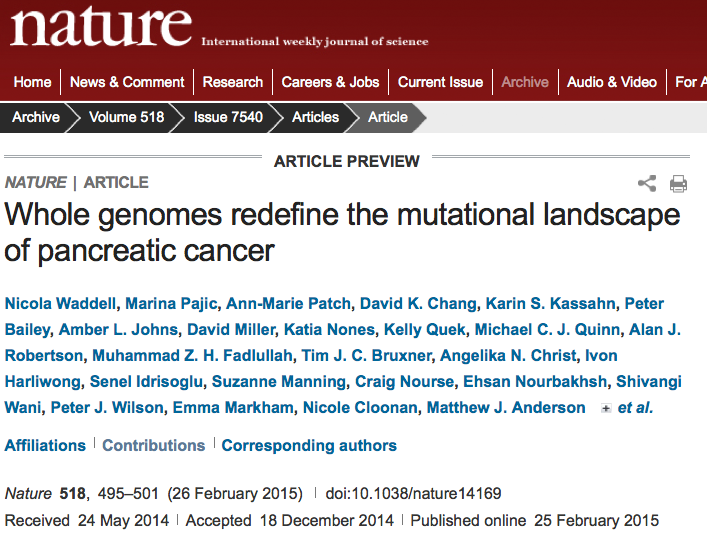 Whole genomes redefine the mutational landscape of pancreatic cancer. Waddell N, Pajic M, Patch A, Chang D, Kassahn K, Bailey P, Johns A, Miller D, et al Australian Pancreatic Cancer Genome Initiative, et al. Nature doi:10.1038/nature14169 Vol. 518 No 7540; 26 Feb 2015. SOX9 regulates ERB signaling in pancreatic cancer development. Grimont A, Pinho A, Cowley M, Augereau C, Mawson A, Giry-Laterriere M, Van den Steen G, Waddell N, Pajic M, Sempoux C, Wu J, Grimmond S, Biankin A, Lemaigre F, Rooman I, Jacquemin P; Gut published online October 21 2014. Clinical and pathologic features of familial pancreatic cancer. Humphris JL, Johns A, Simpson S, Cowley M, Pajic M, Chang D, Nagriall A,Chin V, Chantrill L, Pinese M, Mead RS,Gill A, Samra J, Kench J, Musgrove E, Tucker K, Spigelman A, Waddell N, Grimmond S, Biankin A, Australian Pancreatic Cancer Genome Initiative (APGI). Cancer 14 October 2014 doi:10.1002/cncr.28863. A workflow to increase verification rate of chromosomal structural rearrangements using high-throughput next generation sequencing. Quek K, Nones K, Patch AM, Fink JL, Newell F, Cloonan N, Miller D, Fadlullah MZ, Kassahn K, Christ AN, Bruxner TJ, Manning S, Harliwong I, Idrisoglu S, Nourse C, Nourbakhsh E, Wani S, Steptoe A, Anderson M, Holmes O, Leonard C, Taylor D, Wood S, Xu Q, Australian Pancreatic Cancer Genome Initiative, Wilson P, Biankin AV, Pearson JV, Waddell N, Grimmond SM. Biotechniques 2014 Jul 1;57(1):31-8. doi: 10.2144/000114189. Understanding how consumers would like to engage in the research decision-making process. Holliday C, Kwok J, Yip K, Axford C, Simpson S, Johns A, Zeps N. Cancer Forum July 2014; Vol 38:2. Genome-wide DNA methylation patterns in pancreatic ductal adenocarcinoma reveal epigenetic deregulation of SLIT-ROBO, ITGA2 and MET signaling. Nones K, Waddell N, Song S, Patch AM, Miller D, Johns A, Wu J, Kassahn KS, Wood D, Bailey P, Fink L, Manning S, Christ AN, Nourse C, Kazakoff S, Taylor D, Leonard C, Chang DK, Jones MD, Thomas M, Watson C, Pinese M, Cowley M, Rooman I, Pajic M, Australian Pancreatic Cancer Genome Initiative (APGI), Butturini G, Malpaga A, Corbo V, Crippa S, Falconi M, Zamboni G, Castelli P, Lawlor RT, Gill AJ, Scarpa A, Pearson JV, Biankin AV, Grimmond SM. Intnl J Cancer. 2014 Sep 1;135(5):1110-8. 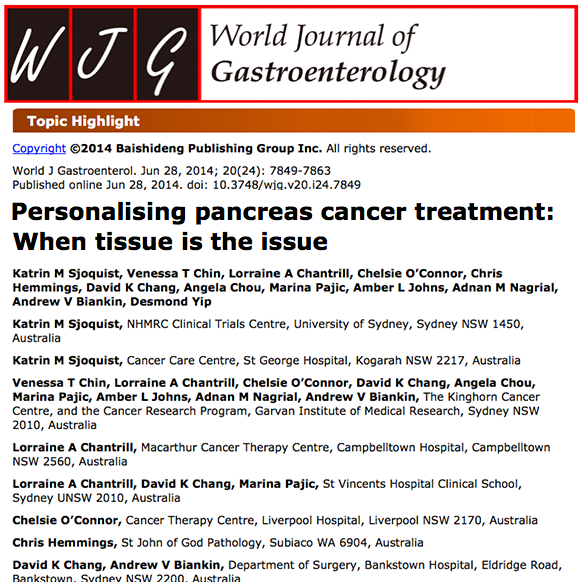 Personalising pancreas cancer treatment: when tissue is the issue. Sjoquist KM, Chin V, Chantrill L, O’Connor C, Hemmings C, Chang D, Chou A, Pajic M, Johns AL, Nagrial A, Biankin A, Yip D. World J Gastroenterol. 2014 Jun 28;20(24):7849-7863. Review. Gemcitabine and CHK1 inhibition Potentiate EGFR-Directed Radioimmunotherapy against Pancreatic Ductal Adenocarcinoma. 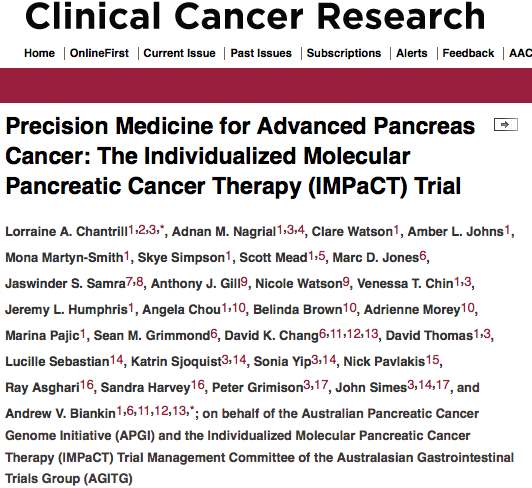 Al-Ejeh F, Pajic M, Shi W, Kalimutho M, Miranda M, Nagrial AM, Chou A, Biankin AV, Grimmond SM, Australian Pancreatic Cancer Genome Initiative (APGI), Brown MP, Khanna KK; Clin Cancer Res. 2014 May 16. Targeting mTOR dependency in pancreatic cancer. Morran DC, Wu J, Jamieson N, Mrowinska A, Kalna G, Karim S, Au A, Scarlett C, Chang D, Pajic M, Oien K, McKay C, Carter CR, Gillen G, Champion S, Pimlott S, Anderson K, Evans TRJ, Grimmond S, Biankin A, Sansom O, Australian Pancreatic Cancer Genome Initiative (APGI), Morton J. Gut April 2014; doi:10.1136/gutjnl-2013-306202. Adjuvant chemotherapy in elderly patients with pancreatic cancer. Nagrial AM, Chang DK, Nguyen NQ, Johns AL, Chantrill LA, Humphris JL, Chin VT, Samra JS, Gill AJ, Pajic M, Australian Pancreatic Cancer Genome Initiative, Pinese M, Colvin EK, Scarlett CJ, Chou A, Kench JG, Sutherland RL, Horvath LG, Biankin AV. Br J Cancer 2013 Nov 21 Doi: 10.1038/bjc2013.722. Signatures of mutational processes in human cancer. Alexandrov LB, Nik=Zainal S, Wedge DC, Aparicio SA, Behjati S, Biakin AV et al. Nature 2013 Aug 22;500(7463) 415-21. Somatic Point Mutation Calling in Lo.w Cellularity Tumors. Kassahn K, Holmes O, Nones K, Patch A, Miller D, Christ A, Harliwong I, Bruxner T, Xu Q, Anderson M, Wood S, Leonard C, Taylor D, Newell F, Song S, Idrisoglu S, Nourse C, Nourbakhsh E, Manning S, Wani S, Steptoe A, Pajic M, Cowley M, Pinese M, Chang D, Gill A, Johns A, Wu J, Wilson P, Fink L, Biankin A, Waddell N, Grimmond S, Pearson J; Plos One 2013 Nov. Vol.8 Issue 11 e74380. 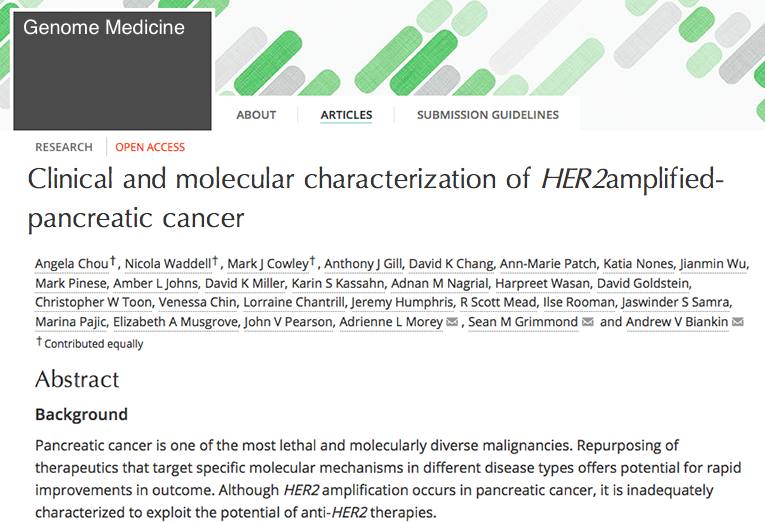 Clinical and molecular characterization of HER2 amplified pancreatic cancer. Chou A, Waddell N, Cowley M, Gill A, Chang D, Patch A, Nones K, Wu J, Pinese M, Johns A, Miller D, Kassahn K, Nagrial A, Wasam H, Goldstein D, Toon C, Chin V, Chantrill L, Humphris J, Mead R, Rooman I, Samra J, Pajic M, Musgrove E, Pearson J, Morey A, Grimmond S, Biankin A. 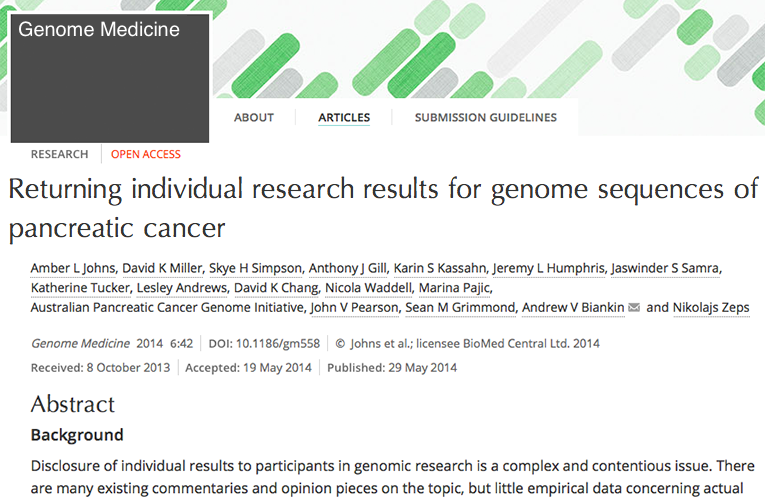 (2013 Aug) Genome Medicine 5:78 doi:10.1186/gm482. Understanding pancreatic cancer genomes. Cowley MJ, Chang DK, Pajic M, Johns AL, Waddell N, Grimmond SM, Biankin AV. J Hepatobiliary Pancreat Sci. 2013 May 10. Contribution of bone marrow derived cells to the pancreatic tumour microenvironment. Scarlett CJ. Front Physiol. 2013;4:56 dpi: 10.3389/fphys.2013.00056. 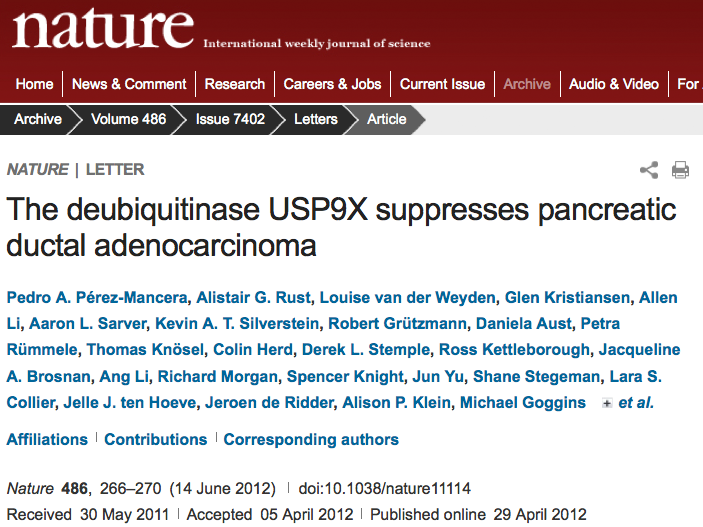 Epub 2013 Mar 26.
qpure: A tool to estimate tumor cellularity from genome-wide single nucleotide polymorphism profiles. Song S, Nones K, Miller D, Harliwong I, Kassahn KkS, Pinese M, Pajic M, Gill AJ, Johns AL, Anderson M, Holmes O, Leonard C, Taylor D, Wood S, Xu Q, Newell F, Cowley MJ, Wu J, Wilson P, Fink L, Biankin AV,Waddell N, Grimmonds SM, Pearson JV. PLoS One. 2012; 7(9):e45835. Epub 2012 Sep 25. Long term nutritional status and quality of life following major upper gastrointestinal surgery – a cross-sectional study. Carey S, Storey D, Biankin AV, Martin D, Young J, Allman-Farinelli M. Clin Nutr. 2011 Dec; 30(6):774-9. SIRT1 promotes N-Myc oncogenesis through a positive feedback loop involving the effects of MKP3 and ERK on N-Myc protein stability. Marshall GM, Liu PY, Gherardi S, Scarlett CJ, Bedalov A, Xu N, Iraci N, Valli E, Liind D, Thomas W, van Bekkum M, Sekyere E, Jankowski K Trahair T, Mackenzie KL, Haber M, Norris MD, Biankin AV, Perini G, Liu T. PLoS Genet. 2011 Jun;7(6):e1002135. Somatic variation and cancer: therapies lost in the mix. Biankin AV, Hudson TJ, Hum Genet. 2011 July;130(1):79-91. Role of pancreatic stellate cells in pancreatic cancer metastasis. XuZ, Vonlaufen A, Phillips PA, Fiala-Beer E, Zhang X, Yang L, Biankin AV, Goldstein D, Pirola RM, Wilson JD, Apte M. Am. J. Pathol 2010 177:2585-2596.
International network of cancer genome projects. 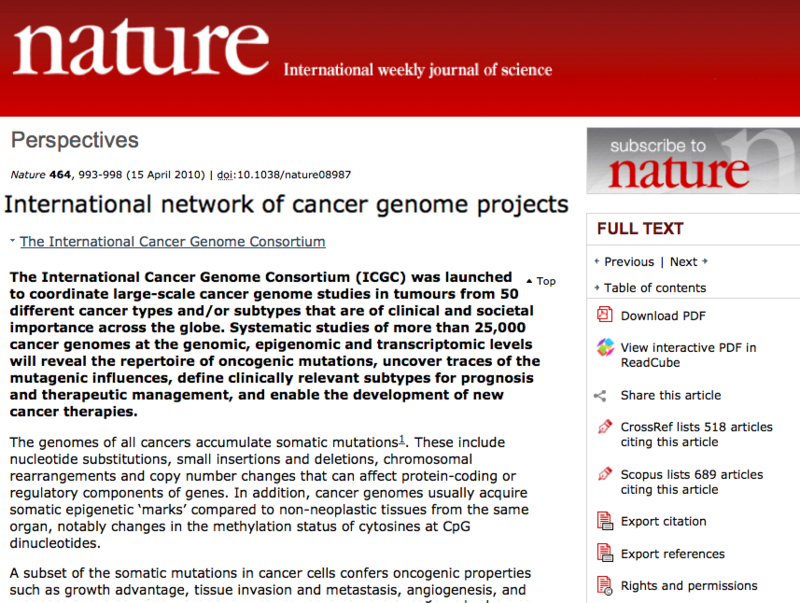 The International Cancer Genome Consortium (2010). Nature. 2010 Apr 15;464(7291):993-8. [PMID: 20393554]. Defining research priorities for pancreatic cancer in Australia: results sof a consensus development process. Robotin M, Jones S, Biankin AV Iverson D, Gooden H, Barraclough B, Penman A. Cancer Cause Control 2010 21:729-739. Transcriptional upregulation of histone deacetylase 2 promotes Myc-induced oncogenic effects. Marshall GM, Gherardi S, Xu N, Neiron Z, Trahair T, Scarlett CJ, Chang DK, Liu Pym, Janglowski K, Iraci N, Haber M, Norris MD, Keating J, Sekyere E, Jonquires G, Stossi F, Katzenellenbogen BS, Biankin AV, Perini G, Liu T. Oncogene. 2010 Nov 4;(44):5957-68. Messina: a novel analyses tool to identify biologically relevant molecules in disease. Pinese M, Scarlett CJ, Kench JG, Colvin EK, Segara D, Henshall SM, Sutherland RL, Biankin AV. PLoS ONE, 2009;4(4): e5337. Real time introperative confocal laser microscopy-guided surgery. Nguyen NQ, Biankin AV, Leong RW, Chang DK, Cosman PH, Delaney P, Kench JG, Merrett ND. Ann Surg. 2009 May; 249(5):735-7. Taking optical biopsies with confocal endomicroscopy. Leong RW, Chang D, Merrett ND, Biankin AV. J Gastroenterol. Hepatol. 2009 Nov:24(11):1701-3. Synoptic reporting improves histopathological assessment of pancreatic resection specimens. Gill AJ, Johns AL, Eckstein RP, Samra J, Kaufman A, Chang DK, Merrett ND, Cosman PH, Smith RC, Biankin AV, Kench JG and NSWPCN. Pathology 2009 41:161-167. Role of endoscopic ultrasound in pancreatic cancer. Chang DK, Nguyen NQ, Merrett ND, Dixson H, Leong RW, Biankin AV. Expert Rev. Gastroenterol. Hepatol. 2009 Jun;3(3):293-303. Margin clearance and outcome in resected pancreatic cancer. Chang DK. Johns AL. Merrett ND. Gill AJ. Colvin EK. Scarlett CJ. Nguyen NQ. Leong RW. Cosman PH. Kelly MI. Sutherland RL. Henshall SM. Kench JG. Biankin AV. J Clin Oncol. 2009 Jun 10;27(17):2855-62. Epub 2009 Apr 27. [PMID: 19398572]. Expression of S100A2 calcium-binding protein predicts response to pancreatectomy for pancreatic cancer. Biankin AV. Kench JG. Colvin EK. Segara D. Scarlett CJ. Nguyen NQ. Chang DK. Morey AL. Lee CS. Pinese M. Kuo SC. Susanto JM. Cosman PH. Lindeman GJ. Visvader JE. Nguyen TV. Merrett ND. Musgrove EA. Henshall SM. Sutherland RL. Gastroenterology. 2009 Aug;137(2):558-68, 568.e1-11. [PMID: 19376121].